"WOW has allowed a staff of RPG developers with little web development skill to create some pretty cool applications with little training." 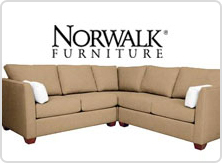 Norwalk Furniture of Norwalk, OH is one of the country's best-known manufacturers of fashionable special ordered upholstered furniture. They offer over 500 styles of furniture available in over 1,000 inventoried fabrics and leathers, all with 30 day delivery and backed by the best customer service in the industry. The sales force at Norwalk Furniture uses notebooks to track POs and delivery status. It is essential to these sales staff that the data is in synch with what is current at the company plant and that the system is integrated with email. As new notebooks were being purchased by the Account Managers at Norwalk, multiple problems were surfacing with the existing sales software package. The software in use was not supported with new operating systems. Norwalk developers wished to replace the older software without going back to a canned software package; hence a strategic, open-ended solution. One of the Norwalk developers came across the WOW product and it seemed that it would fit the initial need without a great learning curve. In addition, the company was looking at getting a dealer service site started. At the time WOW software was purchased, the requirements for the dealer site were not ironed out. However, they knew they wanted to get order and cover status information out on the web to the dealers; another project to leverage the WOW product. 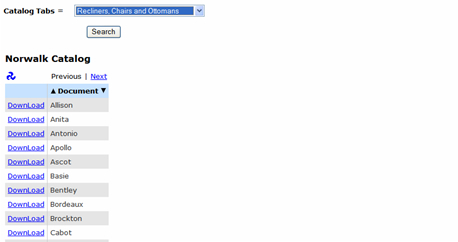 Norwalk Furniture has a small IT staff skilled with RPG and SQL on iSeries. None of the developers in house had prior web development experience. Sales account managers are able to access real-time System i5 data by entering Dealer#, Customer name, and Dealer PO#. 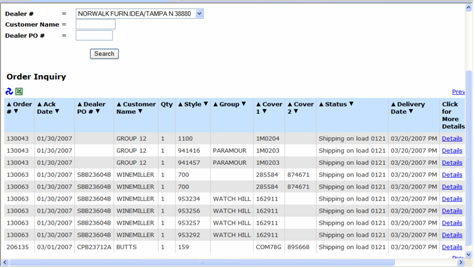 Data is brought to them with the ability to sort columns and drill down to obtain further details. Norwalk Senior Programmer/Analyst, Cara Ferber stated "We had three days of onsite training and an additional two days of consulting to help us get started. Prior to this training, we had started to develop some applications, so I had some questions ready to go for the training. Within two days, we had developed enough in WOW to get our Account Managers online and using the product. The only thing we had left to do was our landing page and setting up the "internet" stuff". The time saved with the Account Manager web site was significant for Ferber's staff. She states, "Since our new website for the sales force, we have hired two new Account Managers. Prior to this web site, I had eight hours of work just in getting one of them set up on the canned software plus hours of training." In using the WOW application, the set up time has been cut to 30 seconds and with, as Ferber comments, "hardly any training". With the dated system, when an Account Manager had problems with their PC, Norwalk's helpdesk person would have to reload their PC and Ferber had to reload the old software and data to their PC. Again, this would take up to eight hours. Also eliminated were the data synchronization errors which could take an average of 30 minutes to fix. An obvious benefit to the Account Managers is the ability to now access the data in real time. "They no longer have to wait for a batch job to run at night and see the data a day late." shipment or what may be delayed. As above, images are downloaded to show product colors with ability to drill down for more details. When a dealer requires further information, pricing details and a product description are provided to assist them with their order. 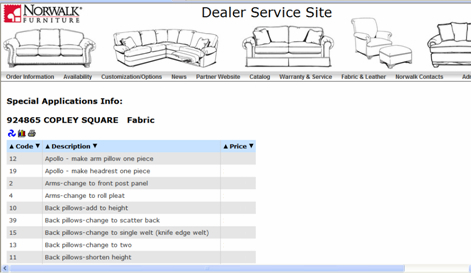 Dealers also have immediate access to download current catalogs. "This is a great step forward in taking all of the information that we now receive from many different sources at Norwalk and putting them under one site." "This is easy. The information contained on the site has been very helpful." "It will make it very easy on the weekends to get information the designers need when they are trying to customize a piece of upholstery." "It is hands-on, user- friendly and it gives the stores a sense of control, especially for confirmation of a date or status of an order." With the mounting problems associated with the Account Manager software, Norwalk Furniture Corporation developers were able to very quickly solve their immediate problem with little training or development time. With the current, WOW application a ton of time is saved in setting up new managers, and the errors seen with the previous method have been eliminated. Norwalk's dealers are very satisfied with data at their fingertips 24x7. As far as their experience, Westerfield explains "WOW configuration has been relatively painless. Most of our applications have worked right out of the box. With the few items that have needed configuration, PlanetJ's support team has been more than willing to supply us with those settings and easy to follow instructions on how to apply them. Also, applying these fixes and other service packs as been simple as well, with PlanetJ proactively supplying us with those items."